"Dr. Doom" redirects here. For other uses, see Dr. Doom (disambiguation). Doctor Doom in Thor #600 (April 2009). Dr. Victor Von Doom (commonly known as Doctor Doom, or simply Doom) is a fictional character appearing in American comic books published by Marvel Comics. The son of a Romani witch, Von Doom has been depicted as a supervillain, the archenemy of the Fantastic Four, and the leader of the fictional nation called Latveria. While his chief opponents have been the Fantastic Four, he has also come into conflict with Spider-Man, Iron Man, Black Panther, and multiple others. Von Doom has also been depicted as a superhero, being the third character to take up the mantle of Iron Man and joining the Avengers. Von Doom has made many appearances in video games, television series, and merchandise such as action figures and trading cards. He was ranked as the 4th Greatest Villain by Wizard on its 101 Greatest Villains of All Time list. IGN's list of the Top 100 Comic Book Villains of All Time ranked Doctor Doom as #3. In a later article, IGN would declare Von Doom as Marvel's greatest villain. Von Doom has also been featured in licensed feature films such as Roger Corman's unreleased 1994 The Fantastic Four played by Joseph Culp, and the 2005 film Fantastic Four and its 2007 sequel Fantastic Four: Rise of the Silver Surfer played by Julian McMahon. Toby Kebbell portrays the character in the 2015 reboot. Created by writer-editor Stan Lee and artist/co-plotter Jack Kirby, the character first appeared in The Fantastic Four #5 (July 1962) wearing his trademark metal mask and green cloak. 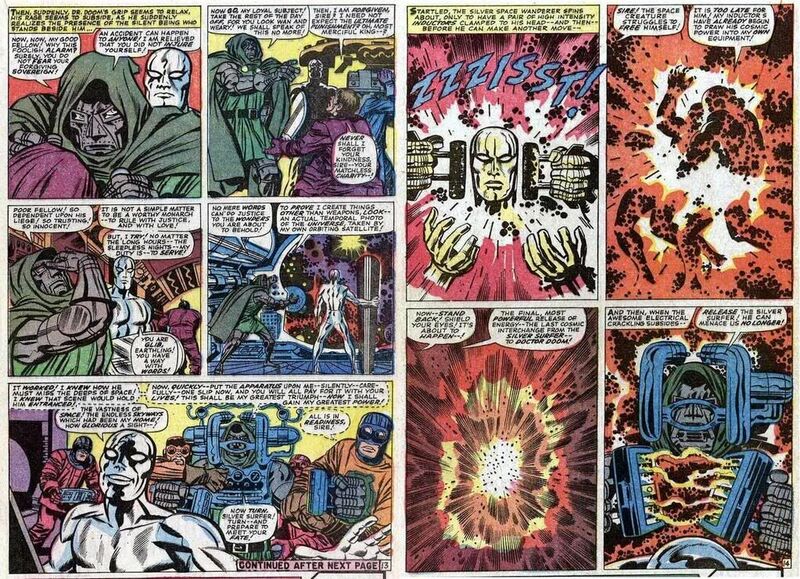 Like many of Marvel's Silver Age characters, Doom was conceived by Stan Lee and Jack Kirby. With the Fantastic Four title performing well, Lee and Kirby were trying to dream up a "soul-stirring…super sensational new villain." Looking for a name, Lee latched onto "Doctor Doom" as "eloquent in its simplicity — magnificent in its implied menace." Fantastic Four #5 (July 1962), Doom's debut. Due to the rush to publish, the character was not given a full origin story until Fantastic Four Annual #2, two years after his debut. Jack Kirby modelled Doom after Death, with the armor standing in for that character's skeleton; "It was the reason for the armor and the hood. Death is connected with armor and the inhuman-like steel. Death is something without mercy, and human flesh contains that mercy." Kirby further described Doom as being "paranoid", wrecked by his twisted face and wanting the whole world to be like him. Kirby went on to say that although "Doom is an evil person, but he's not always been evil. He was [respected]…but through a flaw in his own character, he was a perfectionist." At one point in the 1970s, Kirby drew his interpretation of what Doom would look like under the mask, giving Doom only "a tiny scar on his cheek." Due to this slight imperfection, Doom hides his face not from the world, but from himself. To Kirby, this is the motivation for Doom's vengeance against the world; because others are superior due to this slight scar, Doom wants to elevate himself above them. Typical of Lee's writing characterization of Doom is his arrogance; his pride leads to Von Doom's disfigurement at the hands of his own machine, and to the failures of many of his schemes. While the Fantastic Four had fought various villains such as the Mole Man, Skrulls, the Miracle Man, and Namor the Sub-Mariner, Doom managed to overshadow them all and became the Fantastic Four's archnemesis. During the 1970s, Doom branched out to more Marvel titles such as Astonishing Tales, The Incredible Hulk, and Super-Villain Team-Up, starting in 1975, as well as appearances in Marvel Team-Up, beginning with issue #42 (February 1976). Doom's origin was also a feature in Astonishing Tales when his ties to the villain Mephisto were revealed. In 1976, Marvel and DC Comics collaborated on Superman vs. the Amazing Spider-Man, and seeking to replicate that success the two companies again teamed the characters in Superman and Spider-Man in 1981. Marvel editor-in-chief Jim Shooter co-wrote the story with Marv Wolfman, and recalled choosing Victor von Doom based on his iconic status: "I figured I needed the heaviest-duty bad guy we had to offer — Doctor Doom. Their greatest hero against our greatest villain." The same year, John Byrne began his six-year run writing and illustrating Fantastic Four, sparking a "second golden age" for the title but also attempting to "turn the clock back [...] get back and see fresh what it was that made the book great at its inception." Doctor Doom made his first appearance under Byrne's tenure with issue #236. Whereas Kirby had intimated that Doom's disfigurement was more a figment of Victor's vain personality, Byrne decided that Doom's face was truly ravaged: only Doom's own robot slaves are allowed to see the monarch without his helmet. Byrne emphasized other aspects of Doom's personality; despite his ruthless nature, Victor von Doom is a man of honor. Returning to Latveria after being temporarily deposed, Doctor Doom abandons a scheme to wrest mystical secrets from Doctor Strange in order to oversee his land's reconstruction. Despite a tempestuous temper, Doom occasionally shows warmth and empathy to others; he tries to free his mother from Mephisto and treats Kristoff Vernard like his own son. Byrne gave further detail regarding Doom's scarring: Byrne introduced the idea that the accident at Empire State University only left Victor with a small scar that was exaggerated into a more disfiguring accident by Doom's own arrogance—by donning his newly forged face mask before it had fully cooled, he caused massive irreparable damage. After Byrne's departure Doom continued to be a major villain in Fantastic Four, and as the 1980s continued Doom appeared in other comics such as Punisher, The Spectacular Spider-Man, and Excalibur. Under Fantastic Four writer Steven Englehart, Doom became exiled from Latveria by his heir Kristoff, who was brainwashed into thinking he was Victor von Doom. Doom would spend most of his time in exile planning his return, but Englehart left the title before he could resolve the storyline. This storyline ultimately ended with the controversial Fantastic Four #350, where writer Walt Simonson had the Victor von Doom who had been seen in the book during the Englehart run being revealed to be a robotic imposter and the real Von Doom, in a newly redesigned armor, returning to claim his country from his usurper. According to Simonson's retcon, the last appearance of the real Victor von Doom was in the "Battle of the Baxter Building" story arc, but Simonson's interpretation of the character was unaware of certain major changes at the time to the Fantastic Four. Simonson drew up a list of stories which featured the real Doom and those which did not but later writers ignored Simonson's choices, retconning these story elements as an attempt by Doom to blame his own past failures on unruly robots. Marvel Double Shot Vol. 1 #2 (February, 2003). Writer Mark Waid sought to redefine Doctor Doom in the 2003 "Unthinkable" storyline (Vol 3 #66-70 & Vol 1 #500), by having him forsake technology and invest entirely in magic. The story took its title from the "unthinkable" act Doom had to perform to acquire this new magical might from a trio of demons: killing his first love, Valeria, granddaughter to his long-serving faithful retainer Boris. With Valeria's flesh turned into new mystic leather armor, the story follows Doom as he imprisons Franklin Richards in Hell, captures Valeria Richards, and succeeds in de-powering and imprisoning the Fantastic Four. He subsequently attempts to prove his superiority to Reed Richards by giving him the chance to find his way out of a prison that could only be escaped through magic, in the belief that Richards would fail to do so. With the aid of Doctor Strange, however, Richards learns to utilize magic on a basic level by accepting that he could not understand it and escapes. Richards proceeds to trick Doom into rejecting the demons, resulting in them dragging Doom to Hell. Doom remained trapped there until the events of the 2004 "Ragnarok" storyline in the pages of Thor, which resulted in Thor's hammer Mjolnir falling through dimensions and giving Doom a way out of Hell. In 2005 and 2006, Doom was featured in his own limited series entitled Books of Doom , a retelling of the origin story by Ed Brubaker. In an interview, Brubaker said the series was a way to elaborate on the earlier portions of Doom's life which had not been seen often in the comics. The series also set out to determine if Doctor Doom's path from troubled child to dictator was fated or if Doom's own faults led to his corruption — in essence, a nature versus nurture question; whether Doom could ever become a hero. Brubaker's version of Doom was heavily influenced by the original Lee/Kirby version; responding to a question if he would ever show Doom's face, Brubaker stated "[F]ollowing Kirby's example, I think it's better not to show it." The Mighty Avengers invaded Latveria, Von Doom's nation, due to his involvement in creating a chemical bomb that would infect people with the symbiote (though it was recently revealed that this attack was actually set up by Kristoff Vernard to put Doom out of the picture prior to Kristoff's future attempt at a coup). Due to Ultron's interference, the bomb was dropped on Manhattan, but the Mighty Avengers are able to stop the effects on the people. The Mighty Avengers proceed to invade Latveria. During the invasion, the Sentry, Iron Man, and Von Doom are sent to the past, thanks to the Latverian ruler’s time platform. Eventually, the trio breaks into the Baxter Building and make use of a confiscated time machine to return to the present era, the Sentry taking advantage of the fact he will soon be forgotten by the world to easily defeat the Thing. Doctor Doom transports himself to Morgana's castle to summon up a magical army and captures the Avengers, but they free themselves and he is arrested for terrorist crimes against humanity after a brief struggle that culminated with the Sentry tearing off Doctor Doom's mask. During Dark Reign when Norman Osborn is in charge, Doom is released and sent back to Latveria. However, Morgana le Fay engages him in a magical battle, which he is losing until the Dark Avengers rescue him. He then magically rebuilds his kingdom. The character is also featured in the Siege storyline and in the five issue mini-series Doomwar written by Jonathan Maberry. Doom soon allies himself with the isolationist group known as the Desturi, to take control of Wakanda.Template:Issue He attacked and wounded T'Challa, the current Black Panther, maiming him enough to prevent him from holding the mantle again.Template:Issue Doctor Doom's main objective was to secure Wakanda's store of vibranium, which he could mystically enhance to make himself unstoppable. In the Mark Millar penned Fantastic Four 566-569, Doom received a significant power upgrade. He was thrown back in time (perhaps about 50 million years) by the Marquis of Death. Doom then fought through time and space to get back to the present to seek revenge on the Marquis of Death. Doom stated, as he killed the Marquis, he had rebuilt every molecule of his being and increased his power all to destroy the Marquis. In later issues, this seems to have been ignored, however, with writers treating Doctor Doom the way they have always before in terms of power, the arc later retroactively being said to have been a dream had by Valeria Richards. At the start of the story arc Fantastic Four: Three, Doom feels that he needs to be "reborn" and makes plans to abdicate his throne and give it to Kristoff when Valeria teleports to his room unexpectedly asking for his assistance to help her father. Valeria quickly notices that Doom has suffered brain damage and makes a deal with him to restore his mental capacities if he helps Reed and the Fantastic Four. Doom agrees to her proposition. Later, a humble Doom appears among those in attendance at Johnny Storm's funeral. Due to the agreement, Doom is recommended by Nathaniel and Valeria Richards to be a member of the Future Foundation. Objecting, Thing attacks Doom out of anger, but the fight is stopped by Mister Fantastic and the Invisible Woman, who welcomes Doom to their group. Leading to the Secret Wars, Doom usurps the power of the Beyonders with the aid of Doctor Strange and the Molecule Man, collecting what he can of the destroyed multiverse and forming a new Battleworld consisting of different alternate realities. He also assumes the role of God and claims complete dominion of this new world and its inhabitants, controlling them into thinking he was always the almighty force of creation; following Reed's apparent demise, he takes Sue as his wife, and Franklin, and Valeria as his children. He convinces Johnny Storm and Ben Grimm to be the sun and the Shield wall respectively in Battleworld. However, Richards and a ragtag collection of heroes and villains that survived the destruction of all universes are able to challenge him and, with the help of Molecule Man, are able to take his power and restore the multiverse, something Doom had thought to be impossible. Opting to heal rather than harm, Reed finally uses the Beyonder's power to heal Doom's face, and to purify his soul. Doom returns to Latveria where he saves Tony Stark / Iron Man by incapacitating a group of Latverian rebels with a sonic attack, and vows that he is a new man. He reveals to Tony that he has relinquished his dictatorship over Latveria to give the land back to its people. As a sign of trust, he entrusts Tony with one of the Wands of Watoomb to help him defeat Madame Masque. When more rebels arrive, Doom teleports Stark to the Bronx Zoo. The two later travel to Chicago in order to confront Madam Masque. Discovering Madame Masque to be possessed, Doom has Tony trap her in his Iron Man armor and exorcises the demon from her. Doom disappears before the unconscious Tony regains consciousness. Doom appears once again and interrupts Tony's breakfast date with Amara, continuously trying to prove to Tony that he has changed and is trying to correct the mistakes he has made, explaining that he has arrived to check up on Tony and see if he is suffering from any side-effects from being in the presence of an exorcism. Tony still refuses to trust him after what he has done and Doom leaves once again. Following Stark's comatose state at the hands of Captain Marvel, Doom takes up the mantle of Iron Man, coming into conflict with Mephisto disguised as The Maker, the evil Ultimate Universe version of Reed Richards, joining the Avengers, and later conceiving a child with Dr. Amara Perera. When Ben Grimm and Johnny Storm set out to find their teammates after it is revealed that prolonged separation is weakening the FF's powers, Doom follows them as they begin to travel through parallel universes, offering his help to an alternate Reed Richards in devising a plan to stop this world's Doctor Doom (who has transferred himself into the body of Galactus and consumed every other world in existence save for Earth). In an attempt to save her series and possibly join the Avengers, Gwennpool (unaware that Doom has "reformed") attempted to attack him using an AI Doombot who goes by the name Vincent Doonan to lead her to him. Seeing this coming Doom easily captured her, though not until after she angered him by saying he looked like "Warmachine in a hoodie". He then told Vincent, who resented him though still saw Doom as his father, that he was proud of him. Gwen escaped, not surprising Doom because according to him "They always escape". Unwilling to risk what she sees as possibly her last chance to save herself because Doom has obviously only temporarily reformed, she attacks him anyway and releases an earlier version of Doom who has no problem fighting her and even seeing how she steps out of reality. It soon becomes obvious that Gwen is not established enough to kill Doom and new Doom steps in to defeat his doppelganger and save her. They talk and she accepts that she made a mistake and hopes he's right that people can be reformed. Later she gets Doom, Vincent, Dr. Strange, and Terrible Eye (Her friend Sarah) to help her sidekick Cecil regain human form. Template:Ifsubst Victor Von Doom was born decades ago to a tribe of Latverian Romani people under the rule of an unnamed nobleman called the Baron. Victor's mother was witch Cynthia Von Doom who died by Mephisto's hand while Von Doom was young. His father, Werner, was the leader of the tribe and a renowned medicine man who kept his wife's sorceress life quiet in order to protect Victor from a similar fate. Soon after Cynthia's death, the Baron's wife grew incurably ill from cancer and Werner was called to the capitol to heal her. When she succumbed to illness, the Baron labeled Werner a murderer and called for his death. Werner escaped with young Victor, having realized the night before the woman would die. He goes on to die of exposure on the mountainside, cradling the boy in a final embrace and giving him his garments to keep him warm. Victor survived and, on return to the Romani camp, discovered his mother's occult instruments and swore revenge on the Baron. Victor grew into a headstrong and brilliant man, combining sorcery and technology to create fantastic devices which would keep the Baron's men at bay and protect the Roma people. His exploits attracted the attention of the dean of Empire State University, who sent someone to the camp. Offered the chance to study in the United States, Von Doom chooses to leave his homeland and his love, Valeria, behind. Once in the United States, Victor met fellow student and future rival Reed Richards, who was intended to be his roommate, but Von Doom disliked him and asked for another roommate. After a time, Victor constructed a machine intended to communicate with the dead, specifically his mother. Though Richards tried to warn him about a flaw in the machine, seeing his calculations were a few decimals off, Victor continued on with disastrous results, the machine violently failing with the resulting explosion seemingly severely damaging his face. It is later revealed that Ben Grimm, a friend of Richards who despised Victor for his superior attitude, tampered with the machine. He would later blame himself for Doom's initial fall to villainy and rise to power, but never revealed this information to anyone. Expelled after the accident, Victor traveled the world until he collapsed on a Tibetan mountainside. Rescued by a clan of monks, Victor quickly mastered the monks' disciplines as well as the monks themselves. Victor then forged himself a suit of armor, complete with an iron mask, and took the mantle Doctor Doom. As Doctor Doom, he would go on to menace those he felt responsible for his accident—primarily, Reed Richards of the Fantastic Four. He succeeded in leading a revolution to take over Latveria from the Baron, taking an interest in the welfare of the Roma. In his first appearance, Doctor Doom captures the Invisible Girl, using her as a hostage so the Fantastic Four will travel back in time to steal the enchanted treasure of Blackbeard which will help him to conquer the world and rule it peacefully, but he is fooled by Reed Richards, who swaps the treasure with worthless chains. Doom then forms an alliance with the Sub-Mariner, who places a magnetic device in the Baxter Building. However, Doom uses this to pull him and the Fantastic Four into space, thinking this will rid him of those capable of preventing him from assuming control of the world's governments; the Sub-Mariner gets to Doom 's ship and returns the Baxter Building to New York, stranding Doom on an asteroid. Returning to Earth after learning the secrets of an advanced alien race, the Ovids, Doom accidentally exchanges consciousnesses with Mister Fantastic; Richards, inhabiting Doom 's body, switches the two back, and Doom ends up trapped in a micro-world when he is hit with a shrinking ray he had intended to use on the rest of the Fantastic Four. Doom takes over this micro-world, but leaves after the Fantastic Four end his rule. He is then thrown into space when he attempts to prevent the Fantastic Four from leaving the micro-world. Doom is saved by Rama-Tut, and he returns to Earth to destroy the Fantastic Four by turning each member against the other using a special berry juice. Richards outwits Doom by using the hallucinogenic juice against him. Doom, believing he has killed Richards in a test of willpower, departs certain of his victory and superior intelligence, although saddened. During the 1960s, Doom attempted to recruit Spider-Man into joining forces with him, and he came into conflict with the Avengers when Quicksilver and Scarlet Witch illegally entered Latveria to find a long-lost relative of theirs. He stole the Silver Surfer's powers in 1967, but lost them after breaching a barrier Galactus had set for the Surfer on Earth. During the 1970s, Doom branched out to more Marvel titles, with a battle between Victor von Doom and Prince Rudolfo over control of the Latverian throne being featured in Astonishing Tales. Doctor Doom also attempts to use the Hulk as his slave during two issues of The Incredible Hulk. The character also made several appearances in the story arcs of Super-Villain Team-Up, starting in 1975, as well as appearances in Marvel Team-Up, beginning with issue #42 (February 1976). In August 1981, Doom also made an appearance in Iron Man when the two traveled to Camelot, where Stark thwarted Doom 's attempt to solicit the aide of Morgan le Fay into defeating King Arthur's forces with an army of revived warriors who were slain by the sword Excalibur; Doom swore deadly vengeance for that interference, which stranded him in the past - this vengeance had to be indefinitely delayed in the interest of returning to the present day. A particularly detailed plan saw Doom ally with the Puppet Master to trap the Fantastic Four within the miniature artificial city of "Liddleville", their minds trapped inside tiny cybernetic, part-organic copies of their original bodies. However, Doom perverts what had been intended by the Puppet Master as a chance to give Alicia and Ben a normal life into a trap, deliberately disrupting Reed's connection to his copy to make it hard for him to concentrate while "Vincent Vaughn"- Doom's alias as he monitors the project- belittles him, and the Puppet Master eventually helps the FF learn the truth and escape Liddleville while trapping Doom in the android body he had used to monitor the FF. During John Byrne's run in the 1980s, Doom attempted to steal the cosmic powers of Terrax, but Doom's body was destroyed in the resulting fight between Terrax and the Silver Surfer. Doom survived by transferring his consciousness to another human, and is returned to his original body by the Beyonder (who had reached into the relative future to 'recruit' Doom for the conflict on Battleworld that the FF had participated in a few months ago from their perspective). While on Battleworld, Doom attempted and briefly succeeded in stealing the Beyonder's power, but it proves too vast for him to control and the disembodied Beyonder is able to take his power back. When Franklin Richards was kidnapped by Onslaught, Doom joined the Fantastic Four, Avengers and the X-Men to battle Onslaught in Central Park. An enraged Hulk was able to crack open Onslaught's shell. However, Onslaught remained as pure psionic energy, separated Hulk and Banner, planning to spread across the planet. Thor Odinson plunged into Onslaught, trying to contain him. The Fantastic Four, the majority of the Avengers, and the Hulk-less Banner followed in short order, with Doom being forced to join the sacrifice when Iron Man tackled the villain into the energy mass. Thanks to this sacrifice, the X-Men finally managed to destroy Onslaught. Doom, the Fantastic Four, and the Avengers and Banner were believed dead but were instead saved by Franklin, who created a pocket dimension called Counter-Earth to keep them safe. After several months away, the missing heroes returned from Counter-Earth, except for Doom, who remained there for a time. Doom uncovers the secret power at the heart of the planet, an avatar of his arch-foe Reed Richards' son, Franklin, the super-powered youth who conjured this globe and left a bit of himself behind to guide it from within. Doom managed to convince the little boy to relinquish control of this world with little more than a few errant promises of a better life. When Susan Richards experienced problems with her second pregnancy while Reed was away, Johnny contacted Doom for help, correctly guessing that Doom will be unable to pass up a chance to succeed where Reed failed (due to the complex events involving the then-recent resurrection of Galactus, this pregnancy is a 'repeat' of an earlier one where Sue miscarried). Doom not only saves Sue's daughter but also cured Johnny of a recent problem with his powers where Johnny was unable to 'flame off' without technological support after becoming overcharged with energy from the Negative Zone by channeling Johnny's excess energy into Sue to keep her alive. After the birth, Doom's only apparent condition for his aid is that he be allowed to name Sue and Reed's daughter, calling her 'Valeria' after his long-lost love. However, this inspires a new plan where Doom makes Valeria his familiar while seeking out her namesake as part of a deal with a trio of demons; by sacrificing his old lover, Doom is granted magical powers on the level he would possess if he had spent the past years studying sorcery rather than science. With this new power, Doom trapped Franklin in Hell, immobilised Doctor Strange, and then neutralises the FF's powers, torturing the other three while taunting Reed by leaving him in his magical library, comparing it to giving a dog a road-map as he concluded that it would be impossible for Reed to master sufficient magical skill to be a threat to him. However, Reed was able to release Doctor Strange's astral self from Doom's traps, allowing Strange to give Reed a sufficient crash-course in magic for Reed to free the rest of the team and trick Doom into angering his demonic benefactors, prompting them to take him to Hell. Determined to ensure that Doom cannot be a further threat, Reed takes control of Latveria to dismantle all of Doom's equipment, simultaneously subtly driving his family away so that he can trap Doom and himself in a pocket dimension so that he can make sure Doom never threatens anyone again. However, this plan backfires when the rest of the team attempt to rescue Reed, resulting in Doom transferring his spirit into Sue, Johnny and Ben respectively, forcing Reed to kill his best friend to stop his greatest enemy. Doom was returned to Hell, but Reed is later able to use the same machine Doom once tried to create to travel to Heaven and restore Ben to life. Doom remained in Hell until Mjolnir falls to Earth after the events of Ragnarok as it creates a dimensional tear during its fall that allows Doom to escape, although he decides to focus on rebuilding his power base when he proves unable to even lift the hammer. The events of this were deleted from Marvel Comics continuity in the 2015 series Secret Wars. Later, a Doombot was taken down by Reed Richards, Henry Pym, Iron Man, She-Hulk and others in New York City. Whether or not it was sent by Doom himself remains to be seen, as does his role in the overall conflict. Doom was not invited to the wedding of Storm and the Black Panther. However, he did send a present: an invitation to form an alliance with Latveria, using the Civil War currently going on among the hero community as a reason to quite possibly forge an alliance between their two countries. When Black Panther, on a diplomatic mission to other countries with Storm, did show up in Latveria, he presented them with a real present and extended another invitation to form an alliance with Black Panther. He demonstrated behavior very uncharacteristic of him, however, which may or may not become a plot point later. Panther spurned the invitation, detonating an EMP that blacked out a local portion of Latveria before Doctor Doom 's robots could destroy his ship. Later on, Doom is then shown collaborating with the Red Skull on a weapon which will only "be the beginning" of Captain America's suffering. Von Doom gave the Red Skull the weapon because the Red Skull gave Victor pieces of technology from an old German castle. The castle was owned by a "Baron of Iron" centuries prior, who had used his technological genius to protect himself and his people. The map the Red Skull used to find the castle bore a picture of Von Doom. Doom states that the technology the Red Skull gave him is more advanced than what he currently has and that he will become the Baron of Iron in his future; although he does not agree with the Red Skull's principles, the time paradox the situation causes forces him to comply. The Red Skull is currently in the process of reverse-engineering Doom's weapon for multiple uses, rather than the single use Doctor Doom agreed to. At the end of the first chapter of the X-Men event Endangered Species, Doom is among the various geniuses that Beast contacts to help him reverse the effects of Decimation. He spurns Beast by stating that genetics do not number among his talents. In Spider-Man: One More Day, Doom was among those that Spider-Man contacts to help save Aunt May. Doom also makes Latveria into a refugee camp for the Atlanteans following the destruction of their underwater kingdom as well as becoming allies with Loki in his plot to manipulate his brother into unwittingly release his Asgardian allies. Doctor Doom later defends Latveria from the Mighty Avengers, following a revelation that it was one of Doom's satellites that carried the 'Venom Virus' released in New York City (which was actually hacked by an enemy of Doom). In a battle with Iron Man and the Sentry, the time travel mechanism within his armor overloads, trapping Doctor and his opponents at some point in the past - Doom continues his relationship with Morgan le Fay using his time machine. He and Iron Man managed to get back to the present, but Doom has left Iron Man in his exploding castle. Despite his helping, Doom ended up falsely incarcerated at The Raft. During the Secret Invasion storyline, Doom was among those who escaped the Raft when a virus was uploaded into its systems by the Skrulls. In the aftermath of the Secret Invasion, Doctor Doom became a member of the Dark Illuminati alongside Norman Osborn, Emma Frost, Namor, Loki's female form, and the Hood, intending to seek revenge on the world for falsely ruining his reputation. At the end of this meeting, Namor and Doom are seen having a discussion of their own plans that have already been set in motion. Doom soon allies himself with the isolationist group known as the Desturi to take control of Wakanda, attacking and wounding T'Challa, then the current Black Panther, maiming him enough to prevent him from holding the mantle again. Doom's main objective was to secure Wakanda's store of vibranium, which he could mystically enhance to make himself invulnerable. Doom was also a part of the group known as the Intelligencia after being captured to complete their plan. With the help of Bruce Banner, he escaped and returned to Latveria, damaged by this experience. At the start of the Siege storyline, Doom was with the Cabal discussing the current problems with the X-Men and both Avengers teams. Doom demands that Osborn at once reverse his course of action against his ally Namor, to which Osborn refuses, saying that he and Emma Frost had "crossed the line" with him. Doom, loathing Thor and the Asgardians all the more due to his recent defeat at their hands, claims that he will support Osborn's "madness" should Namor be returned to him, but Osborn refuses. Osborn's mysterious ally, the Void, violently attacks Doom, and an apparently amused Loki tells the Hood that he should go, as there is nothing here for either of them, which the Hood, now loyal to Loki due to his hand in the restoration of his mystical abilities, agrees. However, it is revealed that "Doctor Doom" who had been involved with the Cabal was actually an upgraded Doctor Doombot, which releases swarms of Doctor Doombot nanites against the Cabal, tearing down Avengers Tower and forcing its denizens, such as the Dark Avengers, to evacuate. Osborn is rescued by the Sentry, who destroys the body. When Osborn contacts the real Von Doom, Victor informs him not to ever strike him again or he would be willing to go further. It has been revealed that the Scarlet Witch seen in Wundagore Mountain is actually a Doctor Doombot which apparently means that the real one has been captured by Doom sometime after the House of M event. It is revealed that Wanda's enhanced powers were a result of her and Doom's combined attempt to channel the Life Force in order to resurrect her children. This proves to be too much for Wanda to contain and it overtook her. With Wiccan and Doom's help, they seek to use the entity that is possessing Wanda to restore the powers of mutantkinds. This is stopped by the Young Avengers (who are concerned at the fall-out that would ensue if the powerless mutants are suddenly re-powered) only to find out that Doom intended to transfer the entity into his own body and gain Wanda's god-like powers of re-writing reality for himself. Doom becomes omnipotent with powers surpassing those of beings as the Beyonder or the Cosmic Cube. The Young Avengers confront him, but Doom accidentally kills Cassie just before Wanda and Wiccan stole his new-found powers. At the start of the story arc "Fantastic Four: Three", a guilt-ridden Doom felt that he needed to be "reborn" and was making plans to abdicate his throne and give it to Kristoff when Valeria teleported to his room unexpectedly asking for his assistance to help her father. Valeria quickly notices that Doom had suffered brain damage from his previous battle and is slowly losing his memories; she makes a deal with him to restore his mental capacities if he helps Reed and the Fantastic Four. Doom agrees to her proposition. Later, Doom appears among those in attendance at Johnny Storm's funeral. Due to the agreement, Doom was recommended by Nathaniel and Valeria Richards to be a member of the Future Foundation. Objecting, Thing attacks Doom out of anger, but the fight was stopped by Mister Fantastic and the Invisible Woman, who welcomes Victor to their group. When Valeria asks Victor if he has a backup for restoring his memories, he reveals that Kristoff Vernard is his backup. Afterward, Mister Fantastic, Spider-Man, Nathaniel, Valeria, and Victor head to Latveria to meet with Kristoff and request his help. Mister Fantastic sets up a brain transfer machine in order to help restore Victor's memories and knowledge, which is successful. When Kristoff wants to return the throne to him, Doom states that it is not time yet because of a promise he made to Valeria. When Mister Fantastic asks what promise Doom made to Valeria, Victor states that he made a promise to help her defeat Mister Fantastic when she calls for it. Doom decides to hold a symposium on how to finally defeat Reed Richards. The Thing and the evolved Moloids give an invitation to the High Evolutionary. Dragon Man and Alex Power give an invitation to Diablo. Upon receiving an invitation from Spider-Man, Mad Thinker is convinced to take part in the event. Bentley 23 even gives an invitation to his creator, the Wizard, along with two A.I.M. lieutenants. However, it is subsequently revealed that the 'Richards' they have been invited to defeat are actually members of the "Council of Reeds" (alternate versions of Reed who were trapped in this universe by Valeria a while back, possessing Reed's intellect while lacking his conscience). While Spider-Man and Invisible Woman make sandwiches for the kids, Mister Fantastic, Victor, Valeria, and Nathaniel Richards meet with the supervillain geniuses and Uatu the Watcher about what to do with the Council of Reeds. Around this time, Von Doom performed brain surgery on the Hulk to separate him from Bruce Banner, extracting the uniquely Banner elements from Hulk's brain and cloning a new body for Banner, in return for a favor from the Hulk. This clone is killed soon afterward. Later, Doom is apparently killed by the Mad Celestials. With no knowledge as to how he survived, Doom awakens in the ruins of the Interdimensional Council of Reeds, where Valeria had left him a present: the full army of lobotomized Doctor Dooms from alternate realities who were previously captured by the Council, along with two Infinity Gauntlets from alternate universes. With these resources, Doom created the Parliament of Doom, and interdimensional council maintaining peace across the multiverse. He later returned to again rule Latveria, upon ruling the council for a millennium. An ill-fated excursion into the alternate universe of the one of Infinity Gauntlets resulted in Reed and Nathaniel Richards rescuing Doom from his own council. During the a confrontation between the Avengers and the X-Men, Doom allies with Magneto and others against Red Skull's Red Onslaught form. In an attempt to atone for past misdeeds, Doom absorbs the Scarlet Witch reality-altering powers and resurrects the dead Cassie Lang, whome he had accidentally killed. He subsequently makes a Faustian deal with an unspecified demon to resurrect Brother Voodoo. After returning to normal, Doom is taken into captivity for his initial killing of Lang. With the final Incursion imminent during the Secret Wars storyline, Doom usurps the power of the Beyonders with the aid of Doctor Strange and the Molecule Man, collecting what he can of the destroyed multiverse and forming a new Battleworld consisting of different alternate realities. He also assumes the role of God and claims complete dominion of this new world and its inhabitants, controlling them into thinking he was always the almighty force of creation; he takes Sue as his wife, Franklin, and Valeria as his children, condemns the Human Torch to be the sun and Ben Grimm to be the Shield wall - he also rewrites his own history to resurrect the majority of those whose deaths he caused. Richards and a ragtag collection of heroes and villains that survived the destruction of all universes are able to challenge him and, with the help of Molecule Man, are able to take his power and restore the multiverse. Opting to heal rather than harm, Reed finally uses the Beyonder's power to heal Doom's face and fully turn him into a good man. In the All-New, All-Different Marvel, Doom returns to Latveria where he saves Tony Stark by incapacitating a group of Latverian rebels with a sonic attack. Doom reveals to Tony that he is a new man and wishes to help, giving the latter one of the Wands of Watoomb to keep safe from Madame Masque. When more rebels arrive, Doom teleports Iron Man to the Bronx Zoo. Doom finds Iron Man again and teleports the two to the Jackpot Club in Chicago to confront Madam Masque. Discovering that Madame Masque is displaying symptoms of demonic possession, Doom has Tony trap her in the Iron Man Armor then proceeds to exorcise the demon from her. Doom disappears before Tony regains consciousness. Doom appears once again and interrupts Tony's breakfast date with Amara. Doom is trying to prove to Tony that he has changed and is trying to correct the mistakes he has made, explaining that he has arrived to check up on Tony and see if he is suffering from any side-effects from being in the presence of an exorcism. Tony still refuses to trust him after what he has done and Doom leaves once again. Following the defeat of Tony Stark at the hands of Captain Marvel at the conclusion of Civil War II, Doom discovers his calling. Remembering his dissatisfaction as a God, Doom decides that it was his role to help heal the world. Inspired by Stark, and informing his A.I. duplicate that he intends to establish Stark's legacy, Doom fights for his unique brand of justice as the third Iron Man, and later comes into conflict with Mephisto disguised as The Maker, the evil Ultimate Universe version of Reed Richards. Doom goes on to join the Avengers, and later conceives a child with Dr. Amara Perera. Doom's sudden change sparked grievances that resulted in a group of villains, led by the Hood, to join forces to take down Victor. After the villains besieged Doom several times, the final battle occurred when the Hood attempted to take over Stark Industries, which happened not long after Stark had secretly recovered from his injuries. Tony confronted the Hood and stumbled into Victor. Doom took on the Hood and the demon possessing him one-on-one, and his face was severely burned by the demon in the process. Following the villains' defeat, Victor retreated to the ruins of Castle Doom. Later a young woman named Zora Vokuvic breaks into Castle Doom, demanding to see Doctor Doom. She makes it past the many Doombots that guard the palace, finally confronting Doom himself where she tells him that Latveria as been overrun with dictators and opportunists since Doom left and needs its leader back. Initially rejecting the woman’s pleas for help, showing her his grotesquely scarred face in the process, Victor finally agrees when the girl doesn’t give up, and hands him his iconic mask, telling him Latveria needs its true champion. Taking the mask, he ventures out into Latveria, quashing the civil war that is apparently raging, and vowing to fix the country with his own strength – summoning magical energy as he does. Doctor Doom steals the Silver Surfer’s powers in Fantastic Four #57 (1966). Art by Jack Kirby. Victor von Doom is a polymath and scientific genius. Throughout most of his publication history, he has been depicted as one of the most intelligent humans in the Marvel Universe. This is shown on many occasions, most famously by actually curing Ben Grimm of his Thing form, which Reed Richards has never repeated. On the other hand, Reed Richards managed to process all the computer calculations necessary to save the life of a disintegrating Kitty Pryde by himself, which is a feat that Doom at the time professed to be unable to do. Doom also possesses originally minor mystical capabilities due to teachings from Tibetan monks, but later increased them to a considerable extent due to tutoring from his lover Morgan Le Fay. He is capable of energy projection, creating protective shields, and summoning hordes of demonic creatures. Even at a time when his abilities were consistently referred to as minor, with assistance from his technology and by tag-teaming with Doctor Strange, Doom managed to come in second in a magic tournament held by the ancient sorcerer the Aged Genghis. After Strange relinquished the title of Sorcerer Supreme, he admitted that Doom had enough magical ability that he might become the new Sorcerer Supreme. Doom has also used his scientific talents to steal or replicate the power of other beings such as the Silver Surfer or in one case the entity Galactus' world-ship. The alien Ovoids inadvertently taught Doctor Doom the process of psionically transferring his consciousness into another nearby being through simple eye contact, as well as showing him other forms of technology which Doctor Doom uses to escape from incarcerations and to avoid being killed. However, if his concentration is broken, his mind can transfer back, and he rarely uses this power unless absolutely necessary due to his own ego about his appearance. Doom can exert technopathic control over certain machines, most notably the Doombots. In addition, Doctor Doom has a remarkably strong will, as demonstrated in the graphic novel Emperor Doom when he dared his prisoner, the mind-controlling Purple Man, to attempt to control him and he successfully resisted. Doom also has the ability to use touchscreen devices even though he wears metal gauntlets all the time. Doom’s armor augments his natural physical strength to superhuman levels, to the point where he is able to overpower normal humans and hold his own against superhuman foes Spider-Man, the Hulk and the Thing in hand-to-hand combat, although he tends to rely on long-range tactics when engaging physically stronger foes. It is also nigh-indestructible, capable of taking hits from most superhuman foes to some cosmic level beings and protecting Doom from matter manipulation, reality warping and psychic assaults. The armor has an arsenal of high tech weaponry and gadgets hidden within it, energy manipulation, absorption and projection, is capable of generating a defensive force field and a lethal electric shock stunning or killing anyone who might come in contact with Doctor Doom. The armor is self-supporting, equipped with internal stores and recycling systems for air, food, water, and energy, allowing the wearer to survive lengthy periods of exposure underwater or in outer space. Even without his armor, Doom has proven himself to be a skilled bare-handed fighter, once even killing an endangered lion with a single punch, for no other reason than that he wished to. As the absolute monarch of Latveria, Dr. Doom has diplomatic immunity – allowing him to escape prosecution for most of his crimes – and total control of the nation’s natural and technological resources, along with its manpower, economy, and military. Doom is known for the frequent plot device where in it is revealed that his actions were actually those of a "Doombot", one of Victor von Doom’s many robot doubles, either working on his behalf or as a result of rogue artificial intelligence. The plot element of Doombots is often used to retroactively erase events from Doom’s history. On many occasions, Doom’s only real weakness has been his arrogance. Layla Miller once reflected that Doom is incapable of accepting that he himself might be the reason for his failures. This is most keenly reflected in Doom’s continued refusal to accept responsibility for the accident that fully scarred his face, instead preferring to blame Reed Richards for sabotaging his experiment. While his high opinion of himself is generally accurate, he is unable to accept when others may have a better understanding of a situation than he does – with the occasional exception of hearing the recommendations of heroes such as Mister Fantastic or the Thing when it is to his advantage. Even when teaming up with others against a greater threat, Doom will often try to subvert the alliance for personal gain. For instance, while allied with Adam Warlock and other heroes against the Titan Thanos, he attempted to steal Thanos’ Infinity Gauntlet before its owner had been defeated. Von Doom adheres to a strict code of honor at all times. However, Von Doom will keep his exact word, which may or may not be beneficial to the person to whom he has given his promise. For example, Doom may swear that he will not harm an individual, but that only means he will not personally harm that person; it does not mean he will prevent others from harming that person. Doom’s honor code led him to save Captain America from drowning because Captain America had earlier saved his life, and on another occasion he thanked Spider-Man for saving him from terrorists attacking him in an airport by allowing him to leave alive despite Spider-Man subsequently insulting him. His code of honor also means that he will not attack a respected opponent who is weakened or at a severe disadvantage, as he regards any victory resulting from such circumstances as hollow and meaningless. He has even on several occasions battled opponents who were intent on killing the Fantastic Four, for no other reason than the fact that he does not want the ultimate defeat of the Fantastic Four to come from anyone’s hands but his own. Victor von Doom has been shown to be devoted to the welfare and well-being of his subjects. Once, he even went so far as to let his soul lay bare and be judged by the Panther God of Wakanda, who determined that he genuinely wished for a utopian future where humanity thrived. Doombots - Doombots have the face of the real Doctor Doom but with no hood and have guns. Used for many missions, typically those where he fears defeat. Sometimes, the Doombots even believe themselves to be Doctor Doom. Servo-Guards - Robots that are programmed to attack the enemies of Doom. Time Platform - One of Doctor Doom's most ingenious creations is this functioning time machine. It consists of a platform 10 feet (3.0 m) by 10 feet (3.0 m) by 6 inches (150 mm) and a separate control console. Subjects stand upon the platform, while an operator works the controls. The device can transport characters to virtually any time and place in Earth's timestream, and the operator can instantly return the travelers by manipulating the control console. Doctor Doom does not require the console to return to his own time—he can use the time-circuitry built into his own armor, allowing him to venture into time and return on his own without relying on someone to bring him back. A device to imbue people with superpowers. Doctor Doom's status as one of Marvel's most iconic characters has led to his appearance in many of Marvel's alternate universes and spinoffs, in which the character's history, circumstances, and behavior vary from the mainstream setting. The villainous rendition of Doctor Victor Doom has been included in almost every media adaptation of the Fantastic Four franchise, including film, television, and computer and video games. Rapper MF DOOM bases his persona on Victor von Doom. In the book Superhero: The Secret Origin of a Genre, Peter Coogan writes that Doom's original appearance was representative of a change in the portrayal of "mad scientists" to full-fledged villains, often with upgraded powers. These supervillains are genre-crossing villains who exist in adventures "in a world in which the ordinary laws of nature are slightly suspended"; characters such as Professor Moriarty, Count Dracula, Auric Goldfinger, Hannibal Lecter, Joker, Lex Luthor, and Darth Vader, also fit this description. Sanderson also found traces of William Shakespeare’s characters Richard III and Iago in Doom; all of them "are descended from the 'vice' figure of medieval drama", who address the audience in monologues detailing their thoughts and ambitions. Described as "iconic", Doom is one of the most well-received characters of the Marvel Universe, as well as one of the most recurring; in his constant battles with other heroes and other villains, Doctor Doom has appeared more times than any other character. The comics site Panels of Awesome ranked Doctor Doom as the number one villain in their listing of the top ten villains in comics; Wizard Magazine went a step further by declaring Doctor Doom the fourth greatest villain of all time. Comic Book Resources ranks Victor von Doom as their fourth favorite Marvel character. Journalist Brent Ecenbarger cited him being able to "stand up against entities like Mephisto, the Beyonder, and Galactus and often comes out on top", as well as the tragedy of any "other number of circumstances could have led to Doctor Doom being a savior, but as it is, instead he remains Marvel’s greatest villain. ", a fact that later led to the character's redemption. Fellow journalist Jason Stanhope called his "master[ing] of sorcery and technology an unusual combination", and also felt "his inner sense of nobility sets him apart from lesser villains, in a similar manner to Magneto." Von Doom has also been favorably regarded by those who wrote for the character; Stan Lee declared Doom his favorite villain, saying that Doom "could come to the United States and he could do almost anything, and we could not arrest him because he has diplomatic immunity. Also, he wants to rule the world and if you think about it, wanting to rule the world is not a crime. ", that Doom technically isn't a villain. Mark Waid echoed Lee's assessment of the character, stating that Doom "[has] got a great look, a great visual design [and] a dynamite origin." A ride called Doctor Doom's Fearfall is located at Islands of Adventure in the Universal Orlando Resort. The first Dr. Doom figure was part of the Toybiz Marvel Superheroes line. Later, a Dr. Doom figure in the Marvel Secret Wars line was released with a "Secret Shield"
Toybiz also released a Dr. Doom figure based on the 1994 Fantastic Four television series. In the 21st Century, Toybiz released two Dr. Doom figures in their Marvel Legends line, one of Dr. Doom himself, and a variant Doombot. A few years later, Hasbro released a Dr. Doom figure in their Marvel Legends line. A repaint of this figure was released in 2013 in the Marvel Legends Epic Heroes wave. A rare variant of this figure was also released featuring Dr. Doom in his Future Foundation Armor. In 2008, a "Slash Attack" Dr. Doom figure was released as part of the Fantastic Four: Rise of the Silver Surfer toy line based on the 2007 movie. This figure included the Silver Surfer's stolen surfboard and a cosmic axe. A Dr. Doom figure was part of series 3 of the Marvel Universe figure line. A Future Foundation variant of this figure was later released in a two pack with Spider-Man. Marvel Select also released a figure of Dr. Doom that included his Latverian Throne. In 2012, Dr. Doom was also a part of the trading card game "Hero Attax", where the villain was featured as one of the series most powerful cards. There have been several versions of Doom in the Marvel Minimates line, including, classic, First appearance, and Secret Wars I. ↑ "Doctor Doom is Number 3". Comics.ign.com. http://www.ign.com/top/comic-book-villains/3.html. Retrieved 2015-07-11. ↑ Goldberg, Matt (10 November 2014). "Exclusive: Toby Kebbell Reveals Doctor Doom’s Radically New Origin in THE FANTASTIC FOUR Movie". Collider.com. http://collider.com/doctor-doom-new-origin-fantastic-four-movie/. ↑ 9.0 9.1 9.2 Lee, Stan (1976). Bring On the Bad Guys!. New York: Simon & Schuster. p. 12. ↑ Lee, Stan (1976). Bring On the Bad Guys!. New York: Simon & Schuster. p. 13. ↑ 11.0 11.1 Schumer, Arlen (2003). The Silver Age of Comic Book Art. Collectors Press. p. 76. ISBN 1-888054-85-9. ↑ 12.0 12.1 Morrow, John; Kirby, Jack (2006). The Collected Jack Kirby Collector. TwoMorrows Publishing. p. 101. ISBN 1-893905-57-8. ↑ 13.0 13.1 Schumer, Arlen (2003). The Silver Age of Comic Book Art. Collectors Press. p. 77. ISBN 1-888054-85-9. ↑ Christiansen, Jeff (2004). Marvel Encyclopedia Vol. 6: Fantastic Four. New York: Marvel Entertainment Group. pp. 63–66. ↑ 15.0 15.1 15.2 Ashford, Richard (1995). Greatest Villains of the Fantastic Four: Introduction. Marvel Comics. pp. ii. ISBN 0-7851-0079-2. ↑ Eury, Michael (2006). The Krypton Companion. TwoMorrows Publishing. p. 77. ISBN 1-893905-61-6. ↑ Plowright, Frank (1997). The Slings & Arrows Comic Guide. Aurum Press. ↑ Mari, Christopher (2000). Current Biography Yearbook. H.W. Wilson, Co. p. 81. ↑ Staff (2005-12-10). "The Religious Affiliation of Comic Book Character Victor Von Doom". Adherents.com. http://www.adherents.com/lit/comics/DoctorDoom.html. Retrieved 2008-02-12. ↑ "Image: DoomPowerCosmic0157.jpg, (1023 × 740 px)". i388.photobucket.com. http://i388.photobucket.com/albums/oo326/OneDumbG0/Doom%20Fights/DoomPowerCosmic0157.jpg. Retrieved 2015-08-31. ↑ Cronin, Brian (2007-04-26). "Comic Book Urban Legends Revealed #100". Comic Book Resources. http://goodcomics.comicbookresources.com/2007/04/26/comic-book-urban-legends-revealed-100/. Retrieved 2008-02-14. ↑ 29.0 29.1 Brady, Matt (2005-10-27). "Brubaker on Books of Doctor Doom ". Newsarama. Archived from the original on May 11, 2008. https://web.archive.org/web/20080511200829/http://www.newsarama.com/marvelnew/Nov_previews/BruDoom.htm. Retrieved 2008-02-14. ↑ Tramountanas, George (2005-10-07). "Brubaker of Deflowering Doctor Doom". Comic Book Resources. http://www.comicbookresources.com/?page=article&old=1&id=6014. Retrieved 2008-02-13. ↑ Richards, Dave. "MABERRY DECLARES "DOOMWAR"". Comic Book Resources. http://www.comicbookresources.com/?page=article&id=23285. Retrieved 2010-10-03. ↑ 47.0 47.1 "EXCLUSIVE: Doctor Doom is Marvel's "Infamous Iron Man," from Bendis & Maleev". Comic Book Resources. 8 July 2016. http://www.cbr.com/exclusive-doctor-doom-is-marvels-infamous-iron-man-from-bendis-maleev/. ↑ "Fantastic Four 10 A, Jan 1963 Comic Book by Marvel". Comiccollectorlive.com. http://www.comiccollectorlive.com/LiveData/Issue.aspx?id=f1d9898a-de86-4635-a252-5459de32e56a. Retrieved 2010-08-16. ↑ "Fantastic Four 287 A, Feb 1986 Comic Book by Marvel". Comiccollectorlive.com. http://www.comiccollectorlive.com/LiveData/Issue.aspx?id=1aeb4290-639e-428b-bcf7-c2c282f190a7. Retrieved 2010-08-16. ↑ North, Ryan (May 10, 2016). THE UNBEATABLE SQUIRREL GIRL VOL. 3: SQUIRREL, YOU REALLY GOT ME NOW (1 ed.). Marvel Publications. ISBN 978-0-7851-9626-6. ↑ "Revamped Doctor Doom Respect Thread/VIII. SKILL". Killer Movies Community Forums. http://www.killermovies.com/forums/f98/t495216.html. Retrieved 2011-03-28. ↑ 112.0 112.1 Sanderson, Peter (2007-02-24). "Comics in Context #166: Megahero Vs. Megavillain". QuickStopEntertainment.com. http://www.asitecalledfred.com/2007/02/24/comics-in-context-166-megahero-vs-megavillain/. Retrieved 2008-02-13. ↑ Sanderson, Peter (2007-02-17). "Comics in Context #165: The Supervillain Defined". QuickStopEntertainment.com. http://www.asitecalledfred.com/2007/02/17/comics-in-context-165-the-supervillain-defined/. Retrieved 2008-02-13. ↑ 114.0 114.1 "Love Him or Hate Him: Doctor Doom". UGO Networks. Archived from the original on 2007-12-10. https://web.archive.org/web/20071210190448/http://www.ugo.com/a/love-or-hate/?person=doctor-doom. Retrieved 2008-02-10. ↑ Haynes, Mike (2007-12-10). "Countdown: Top 10 Comic Book Villains". Panelsofawesome.com. Archived from the original on 2008-06-14. https://web.archive.org/web/20080614151432/http://www.panelsofawesome.com/2008/04/22/countdown-top-10-comic-book-villains/. Retrieved 2008-02-12. ↑ McCallum, Pat (July 2006). "100 Greatest Villains Ever". Wizard (177). ↑ Brian Cronin (2007-09-26). "Top 50 Marvel Characters #4". Comic Book Resources. http://goodcomics.comicbookresources.com/2007/09/26/top-50-marvel-characters-4/. Retrieved 2008-02-14. ↑ Brummett, Erin (2007-08-15). "VOA Online Discussion: Comic Book Heroes". Voice of America. Archived from the original on 2007-12-15. https://web.archive.org/web/20071215091332/http://www.voanews.com/english/15-August-2007-Chat-Transcript-Stan-Lee.cfm. Retrieved 2008-02-02. ↑ Contino, Jennifer (2003-05-29). "Waid's Fantastic Quartet". ComicCon.com. Archived from the original on 2009-04-13. https://web.archive.org/web/20090413192513/http://www.comicon.com/cgi-bin/ultimatebb.cgi?ubb=get_topic&f=36&t=001050. Retrieved 2008-02-14. ↑ "Doctor Doom's Fearfall". Universal Orlando Resort. Archived from the original on 2008-02-13. https://web.archive.org/web/20080213033807/http://www.universalorlando.com/ioa_attr_fearfall.html. Retrieved 2008-02-14. Doctor Doom at Don Markstein's Toonopedia. Archived from the original on April 4, 2016. "The Galactus Trilogy" • "This Man... This Monster!" • "Days of Future Present"